Today I have another wonderful card for you. 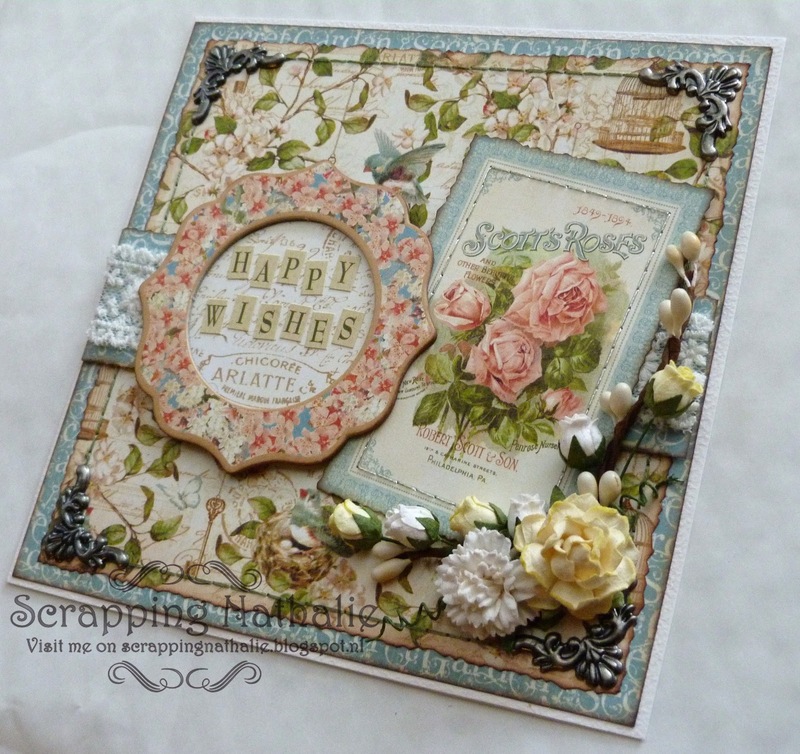 This one is also made with the Graphic 45 Secret Garden 8x8 paperpad, chipboard elements and sticker elements. I've used 2 different sheets of papers to create the background for this card which I then handstitched with pale green DMC yarn. I've added antique silver metal photo corners to finish it. I've added a border with the Secret Garden paper on which I used Marianne Design lace ribbon. On the banner I've added a chipboard element with a background paper from the paper pad. The title was made with the alphabet stickers. The little tag is a cutout from one of the papers which is handstitched with DMC silver yarn. All the papers are inked with Colorbox Cateye dune and sepia inks.The flowers and buds are store brand mulberry flowers. I also want to mention that I found out today, that me cards have been used for publishing on the Harlekino webshop as Inspiration cards. After a nice phonecall, I was informed they were just as surprised and pleased to hear that these cards were made by a fellow Dutch scrapper. I feel very honoured and humbled that they find me cards very beautiful and publishing worthy. Thank you Marion and Jeroen for publishing them in your webshop.